Riverside interceptor regulating chamber access structure. 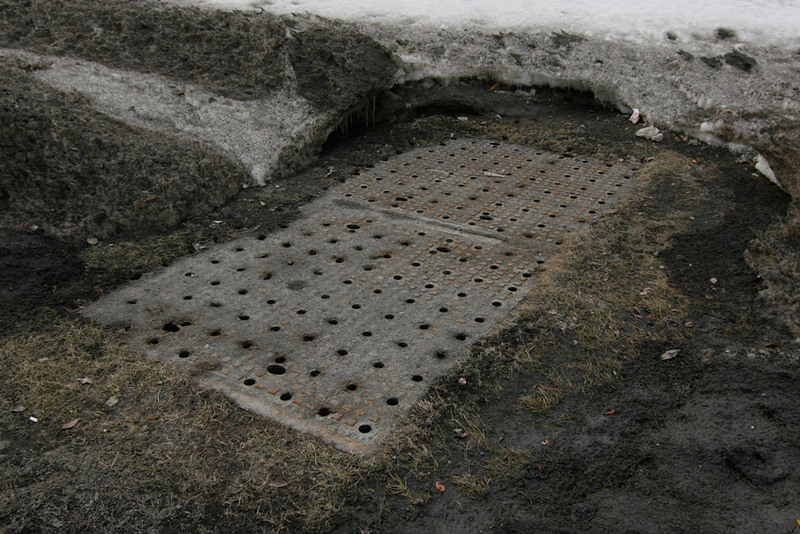 A typical interceptor manhole cover. C.U.M. is the abbreviation for Communauté urbaine de Montréal. 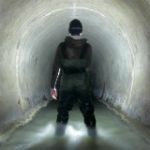 If there’s one thing that strikes fear into the hearts and minds of Montreal drainers (all three of us), it’s the island’s deep-level network of interceptor sewers. They are big concrete tunnels (up to 14.5 meters in diameter), often running at 100 feet below grade and with a ferocious amount of raw sewage coursing through them. All the wastewater of Montreal eventually drops down into one of these three tunnels. Our biggest fear is that we’d somehow end up going straight down there with it. Because of this, we tend to keep our distance from anything marked “Intercepteur” and avoid passing through sections of sewers that come close to emptying into them. Fortunately, there are still ways to have a look at the network from a safe distance. The interceptor’s primary role is to collect the island’s sewage and storm runoff and transfer it to the island’s treatment plant before it has a chance to flow into the surrounding water. 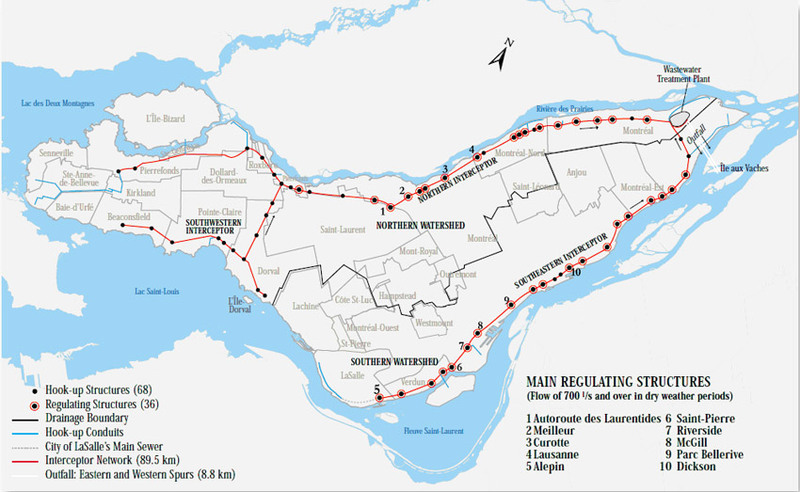 This might seem like common sense, but Montreal didn’t even have a functioning treatment plant until 1987 and at that time only a portion of this network had been completed. It would take eight more years before the entire system was completed, twenty five years after its construction was first ordered. The island of Montreal’s three interceptor lines (shown here in red) and locations of various control structures. 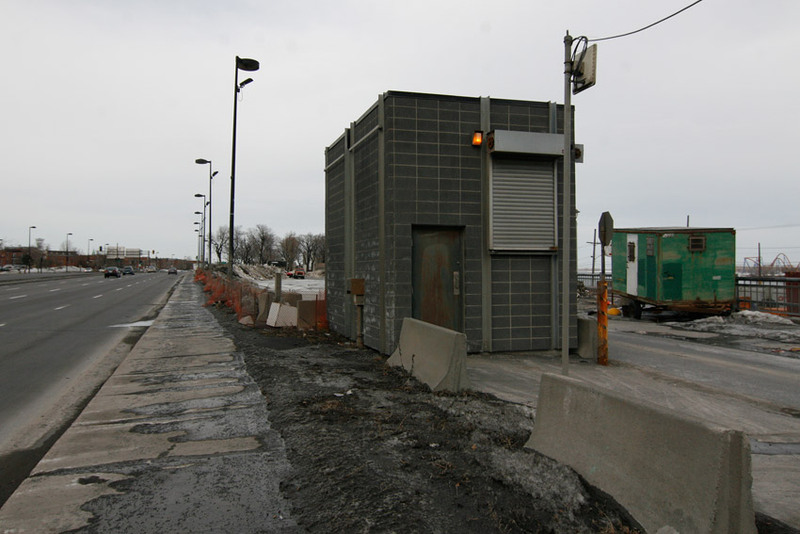 Downtown Montreal’s sewage falls into the Southeastern interceptor before being fed by gravity towards the treatment plant in Pointe-Aux-Trembles a good twenty kilometers away. 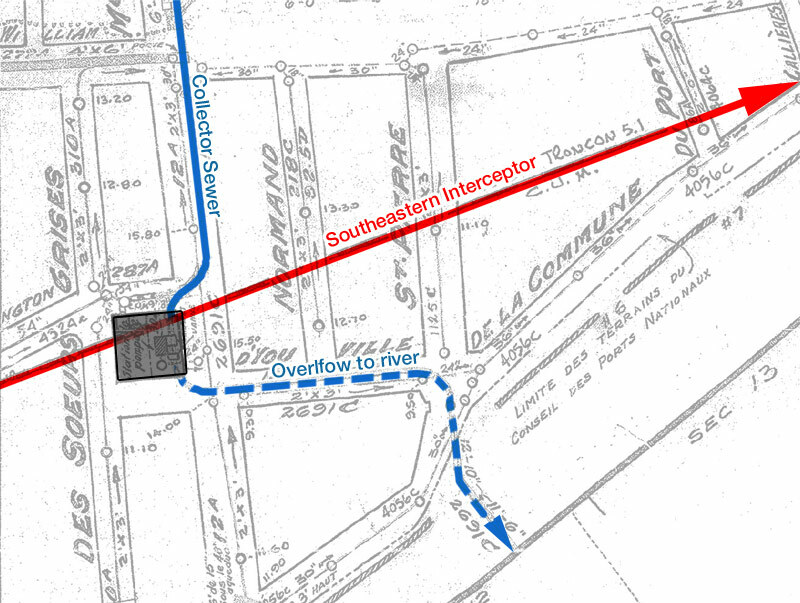 Detail showing typical interceptor and collector sewer intersection. A pumping station sits at the point where these lines meet. Most of the time this system works quite well and everything gets treated before being discharged back into the environment. The problems come during prolonged periods of rain. The treatment plant reaches maximum capacity, leaving no choice but to let the excess flow drain out into the open water. These combined sewer overflow (CSO) events are symptomatic of older cities like Montreal, and not surprisingly are the source of much pollution. However, it’s somewhat of a small price to pay given that before this system was put in place, raw sewage was flowing out into the environment 24/7 every day of the year. Once you know this, it’s hard to complain about the odd overflow taking place. The network of tunnels is of course hidden from view, but its corresponding infrastructure can be found above ground if you know where to look. 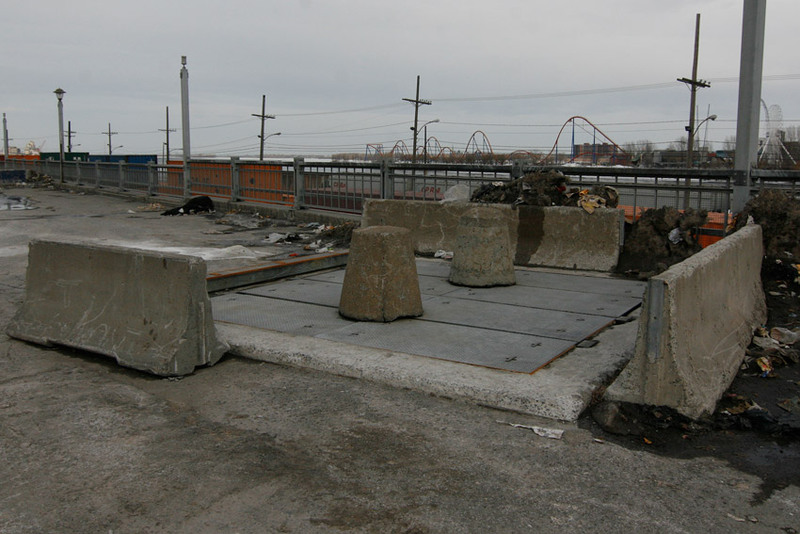 Roughly 70 components consisting of pumping stations, diversion structures, gate chambers and inspection points dot the urban landscape. Their designs range from quirky to elegant to mundane. 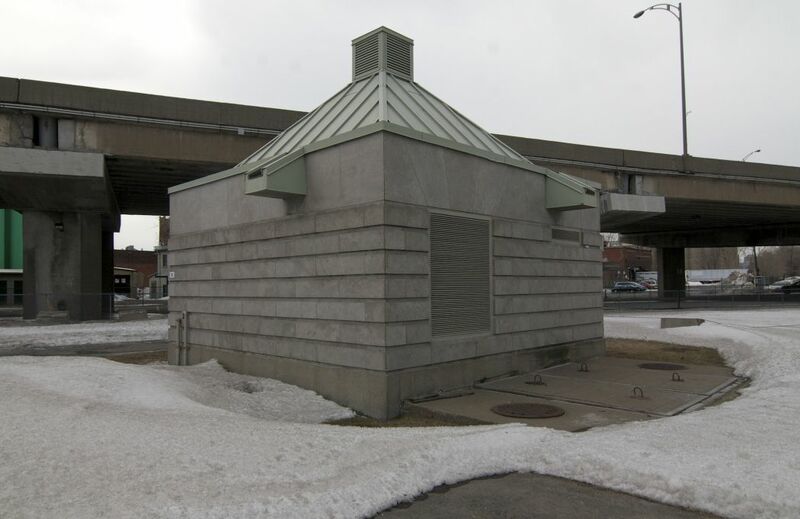 One of the more ornate pumping stations at McGill and Wellington that also doubles as an “interpretive look-out” for tourists. Not surprisingly, there’s mention of the sewers below. 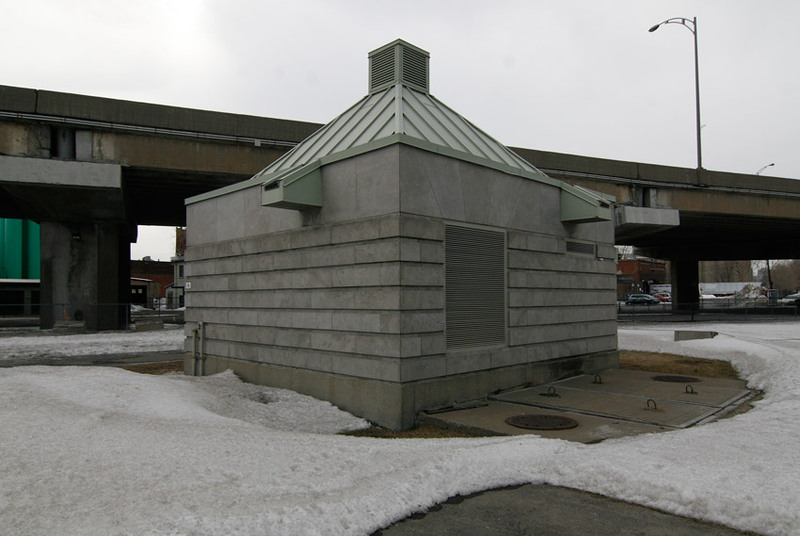 A more austere-looking regulating structure on Riverside adjacent to Highway Bonaventure. 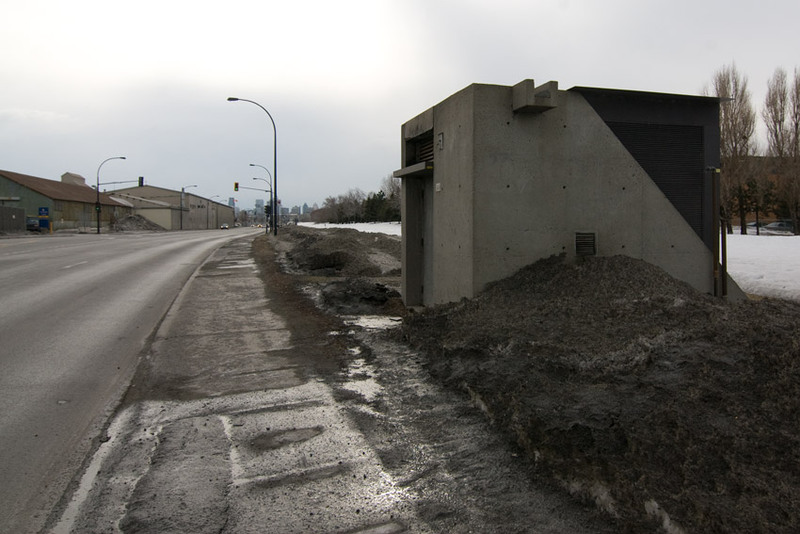 Brutalist-style inspection shaft entrance structure on Notre Dame East near Pie IX blvd. Ventilated panels covering the top of an inspection shaft. The interceptor tunnels also provide a convenient way to get rid of snow after its been plowed from the streets. Perhaps not as convenient as just dumping it into river, but ever since the city prohibited it tossing it straight into the sewer system is the next best thing. Bellerive Snow Dump at Notre Dame and Parthenais. Panels covering one Bellerive’s three chutes used for snow disposal. The PDF linked at the end shows that the drop shafts have stairs down them and gatehouses before the sewer flows into them. I also recall seeing images from inside a dropshaft somewhere on the web. Just what really is the risk of getting swept into one? Is there always a significant amount of flow into the dropshafts? Yeah, I think the risk depends a lot on which sewer you’re in. 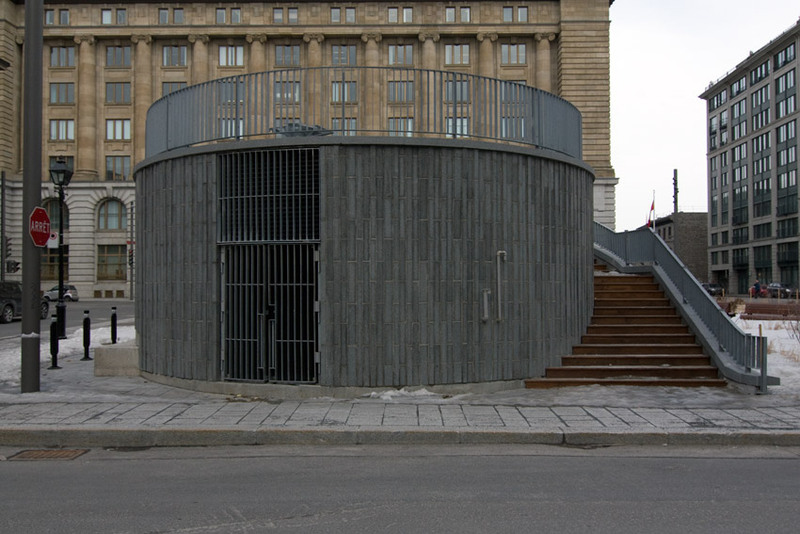 The smaller sewers (seven feet or less) tend to terminate directly into the dropshaft with only a rusty chain dangling from the ceiling for security. These are the ones that are worrisome. Larger ones tend to involve a bit more of a detour to get to the interceptor, but the intermediary steps along the way are probably dangerous enough on their own. In one case there’s a 12 foot drop at end of the collector sewer into the diversion chamber. I wouldn’t exactly want to go flying off of that. The flow inside the sewers here is usually coming down strong and fast enough to make these things a bit of an issue. And you’re right about the drop shafts. Some of them have full staircases leading down to the bottom while others just have a series of caged ladders. I’ve been inside the latter type and I’ll be posting pictures sometime in the future. I still think we should call to get a visit of the treament plant sometime..
I’m sure they’d be more than willing to give three of us a tour. Make it happen! This is very interesting stuff. I love finding out how city systems are built. The city of Vancouver (and nearby municipalities) have a very similar sewer system of small collectors flowing to interceptors flowing to distant treatment plants. The snow dumps are a unique touch. I was lucky to be part of a group that got full tours of both drinking water and wastewater treatment plants here in Montreal, as part of a Canadian Water Network retreat. Desbaillets was really amazing, and we went to Atwater as well. 1) from a historical perspective,I really like this stuff,and have watched a lot of PBS Underground Cities. 2)I used to work for a company(now defunct) that specialised in building municipal water and sewage treatment facilities. 3)I fabricate made to measure grease traps and pumping stations, and am interested in what you’ve seen as far as grease/fats build-up inside modern sewer sections.